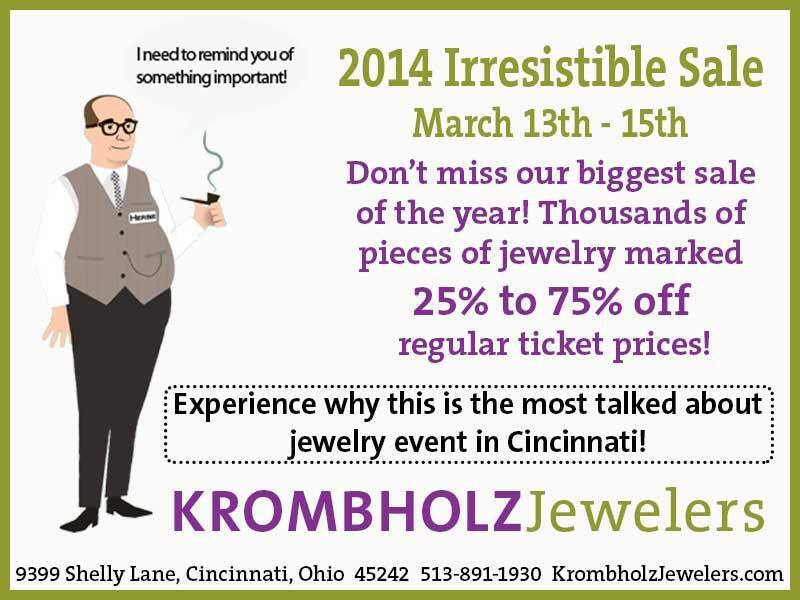 Krombholz Jeweler’s Irresistible Sale March 13-15! Krombholz Jewelers, one of my favorite local jewelers, is having a big sale beginning Thursday, March 13th through Saturday, March 15th. As the last of the winter weather makes it way out of the Tri-State (hopefully!) and spring prepares for her arrival, Krombholz’s 2014 Irresistible Sale is one you won’t want to miss! They’ve pulled out their best selection of close-out merchandise from supplier parters as well as a selection of vintage and antique pieces. Thousands of pieces of jewelry will be marked 25% to 75% off regular prices. Krombholz Jewelers will be open March 13th and 14th from 10 a.m. to 6 p.m. and March 15th from 10 a.m. to 4 p.m. so be sure to stop by!